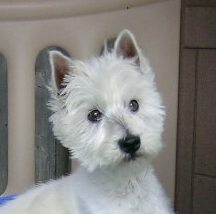 Dawson came to Scottie Kingdom Rescue as his last chance. Both of his rear legs were paralyzed and he was incontinent. But Dawson wanted to enjoy what life he had, so he chose to scoot across floors, faster than most dogs could walk. There certainly wasn't anything wrong with his upper body and he used it as much as possible! Our hopes of surgery helping Dawson regain the use of his legs were quickly dashed, but we still hoped to find ways to make him mobile. We investigated doggie "wheel chairs" (carts) and talked with several people that had a disabled dog in their home. There was still hope that Dawson could have a fairly normal life, albeit a special life. But something changed in the last week that Dawson was with us. His upper body became unstable, he started loosing his appetite and then quit eating altogether. His major organs began to fail and all thoughts for a continuing life were now just a lost hope. Dawson traveled to the Rainbow Bridge on April 24, 2006 at 7:30PM, but he left us with the knowledge that he faced his physical problems with great dignity and never once complained of what life had dealt him. What a special young man Dawson was. Although not physically with us anymore, he certainly showed us what bravery is all about.